Crepes are one of the more satisfying foods. I find the whole experience of making them enjoyable. I love spreading the batter into a thin pancake over a hot pan and stuffing it with all the sweet or savory things. Then there’s the fact that you can melt chocolate, jam, [vegan] butter, or [vegan] cheese on right onto it, I mean-HELLO. And I think folding it up and having layers of pure crepe-and-filling tastiness makes it so much more fun to eat. I love that can take it wrapped in some baking paper on the street or on the go because eating with my hands is my favorite, though going the more decadent it’s-a-meal (or it’s a dessert) route digging in with a knife and fork is pretty great too. But then maybe the satisfaction just boils down to how delicious they are any way you eat them! Crepes are a nostalgic food for me, a remnant of short spurts of time spent living in France as a kid. They were one of the few instances of me seeking out foods with a slightly eggy flavor (I’ve always hated the taste of eggs), so you can imagine how much more excited I am about vegan crepes. 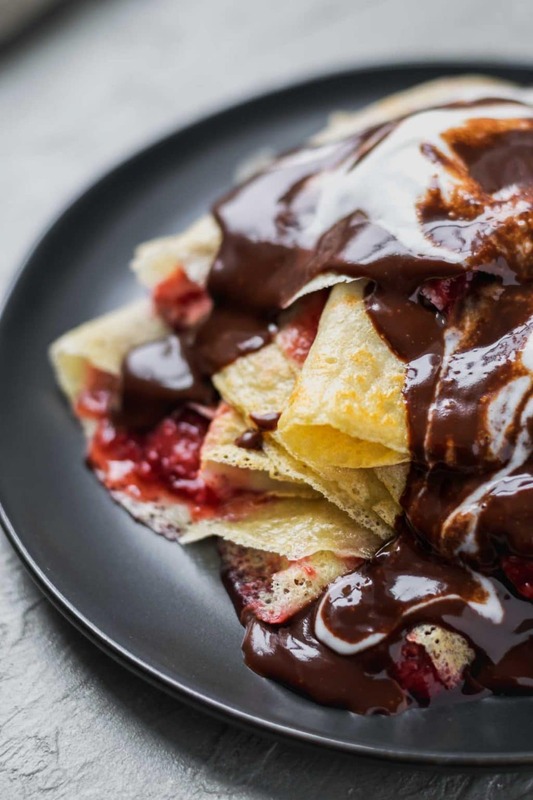 If you remember the crepe craze that took the US by storm in the late 2000s/early 2010s, you might think that vegan crepes are challenging or nigh impossible, as most shops did not (and still do not!) offer a vegan crepe option, but it’s just not true. They’re so simple to make and no fussier than their traditional counterparts, you just need a little practice to get the hang of cooking them (the same is true of the egg-based versions). These crepes have only 6 ingredients, plus the oil you need to grease the pan between pours. And the instructions couldn’t be simpler! Blend (or vigorously whisk if you don’t have a blender) all the ingredients together, to both combine and aerate the batter for a lighter crepe, and let the batter sit in the fridge for at least 1 hour (if in a hurry, let it rest for 30 minutes on the counter). I love preparing the batter the night before, so by the time I roll out of bed and head downstairs its almost no time until I’ve got crepes on my plate! Resting the batter lets the flour properly hydrate, which will thicken the batter to the correct consistency. It also lets the gluten relax after that vigorous mixing in the blender so you can spread the batter thinner. To shape and cook the crepes you don’t need any special tools, but I’ll be honest, they do make your life easier (and therefore makes your crepe making more frequent). When I started making crepes it was with my regular 9″ cast iron skillet and I would pour the batter in and then lift the pan and rotate it in a circular motion so the batter rolls around into a thin round. 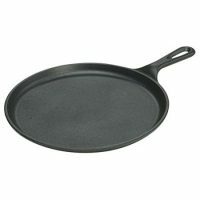 More recently I got a 10.5″ cast iron skillet with a low rim (this one) and proper crepe spreader and spatula (I got this set). Using these tools turns out the most consistently thin crepes, and makes them a breeze as well as gives my poor wrists a break from turning my heavy cast iron pans. But beyond needing a really non-stick pan (well seasoned cast iron works as do coated non-stick skillets), crepes are not fussy. These crepes use two kinds of flour: all purpose white and chickpea. All purpose flour provides the gluten (the protein molecule in wheat) which helps provide structure to the batter and make them easier to handle without tearing. A little chickpea flour works wonders to give a little eggy taste and consistency. Too much chickpea flour and the batter turns a bit bready, but just a little and you have crepe perfection. I add a bit of arrowroot starch (tapioca starch and cornstarch work perfectly as well) as a partial egg replacer. 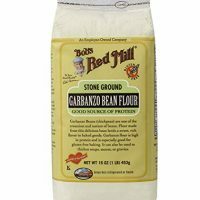 The starches gelatinize a bit when hydrated and lends some stability and structure to the batter, as well as thickens it a bit. Use the plant milk of your choice + a bit of water to thin and a bit of salt and that’s all you need for your perfect crepe! If you’d like, you can always add a little sweetener to the batter (2 tbsp of sugar or agave work perfectly) and some vanilla extract (1/2 tsp) for a sweet base. But my personal preference is for less sweet and there’s enough sugar in my plain soy milk to balance the savory. 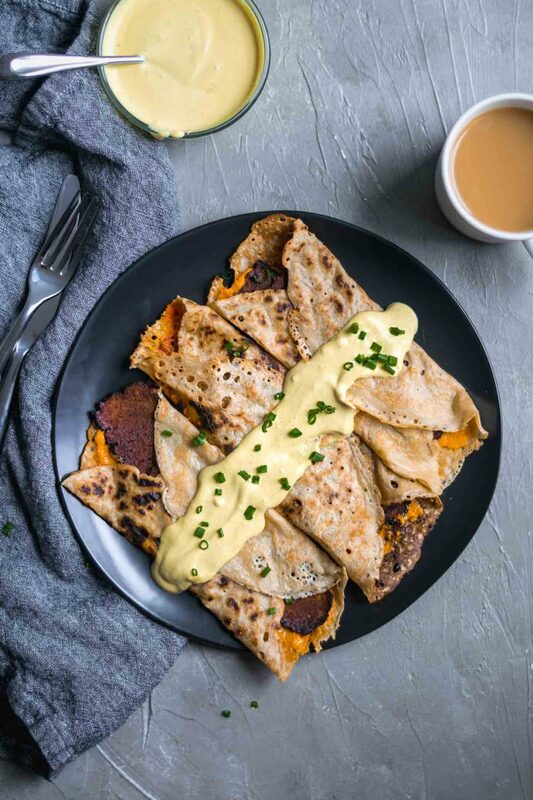 It also makes these crepes perfect for savory applications as well, such as the vegan cheddar cheese and seitan bacon crepe pictured below. These savory crepes were cooked over medium heat and also a bit longer so the cheese would melt, making final crepes more browned than if you followed the instructions here. 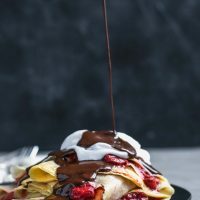 I hope this recipe helps demystify vegan crepes a bit and inspires you to get into thin-pancake making! I love them so much, they’re just too much fun to eat and look so impressive to serve. Let me know if you make these you can leave a comment and/or rate the recipe below. 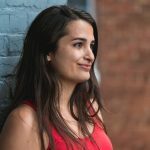 I love hearing what you think! As always, don’t forget to tag your recreations @thecuriouschickpea and #thecuriouschickpea on Instagram, or share with me on Facebook! Happy breakfast-ing (or dessert-ing, or dinner, or brunch.. you get the idea)! To make a sweet crepe add 2 tbsp of sugar (or sweetener of your choice) to the batter, and 1/2 tsp of vanilla extract. 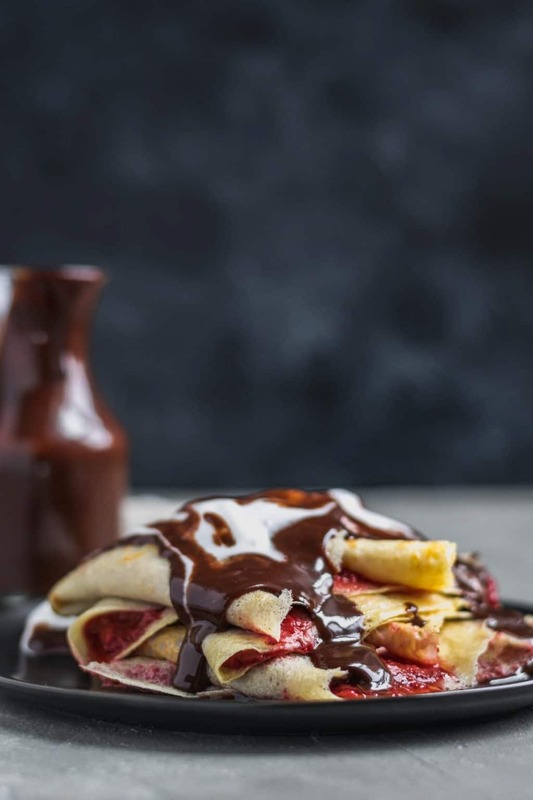 These crepes are wonderful served with a fruit compote (or jam), with a chocolate spread, or simply melted chocolate (add chocolate chips when you flip, they’ll melt from the heat). They’re also perfect for savory applications! 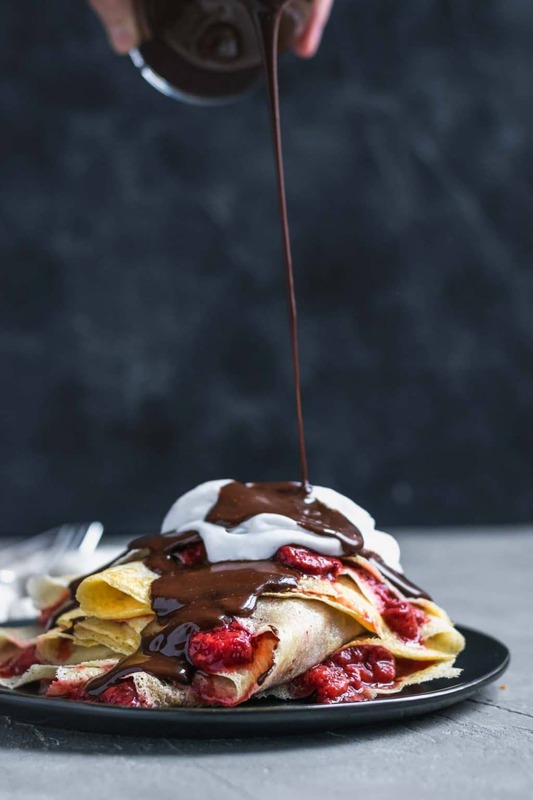 Let your imagination and crepe-making go wild! These egg-free, vegan crepes are delicious for sweet and savory breakfasts. They're easy to make, thin and flexible, perfect for rolling up or folding over and filling with your favorite things! Put all ingredients into a blender and blend until well combined, about 30 seconds. Transfer the batter to a sealed container and place in the fridge to chill for 1 hour, or up to 24 hours before. Stir before using. If you're in a hurry you can rest the batter at room temperature for 30 minutes. Let the crepe cook until the top no longer looks wet, the edges are starting to curl up and the side touching the pan is a light golden color, about 2-3 minutes, then gently flip by loosening the edges of the crepe first then sliding the spatula under the crepe. Cook an additional 1 1/2 - 2 minutes, or until the bottom side is cooked and lightly golden. When you flip, this is when you can add any fillings that you want to melt such as: butter, nutella, chocolate chips (which will melt from the heat), vegan cheese, etc. Repeat with the remaining batter, spraying the pan with oil between each crepe. Chocolate sauce: 1/2 cup plant milk, 1 cup chocolate chips, 2 tbsp melted coconut oil. Heat the milk over medium heat in a saucepan until simmering. Turn off heat and add chocolate chips. Swirl the milk to cover the chips then let it sit for a couple of minutes. Whisk starting from the center and working out until the chocolate has melted, then add the melted coconut oil and whisk to combine. Serve warm. Strawberry compote: 10oz frozen strawberries, 2 tbsp sugar or more to taste. Cut strawberries in half or quarters and and place in a small pot with 2 tbsp of sugar. Cook covered over medium-low until the strawberries are soft and have broken down to your desired consistency. Taste and add sugar if desired. It will thicken as it cools. The Sweet Earth Foods people (Benevolent Bacon makers) shared your photo of the vegan bacon and cheese crepes (with vegan Hollandaise sauce) over the past day or so on Facebook. 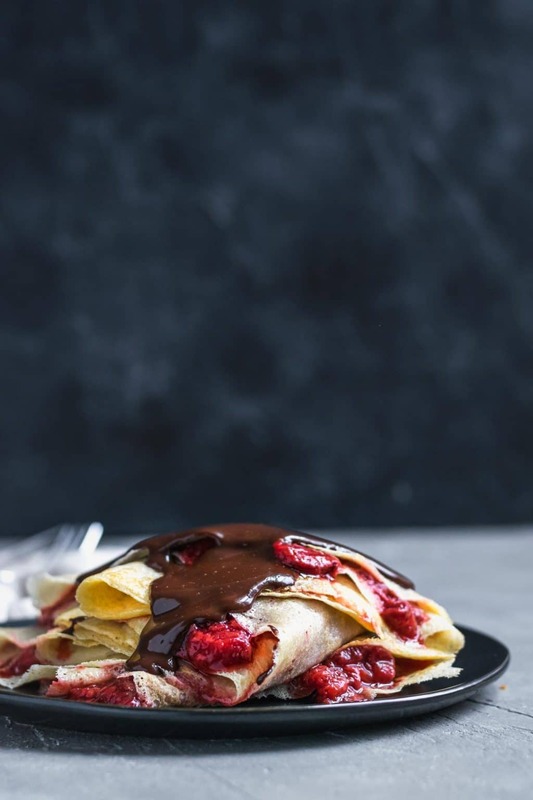 I am so glad that I found this blog entry, as I want those crepes! (I can probably wing it on the fillings, broccoli and cheese, even, as bacon really isn’t my thing, even the veggie kind.) Thank you so much, Eva!